Toughmet 3 CX is alloy C96900 Nickel Bronze that is spinodally hardened to pick up properties exceeding those regularly found in other high strength copper alloys. 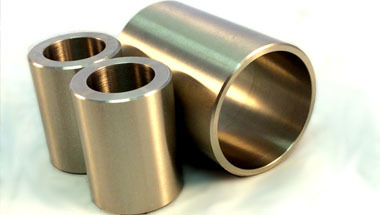 This Copper-Nickel-Tin Alloy has properties like Copper Beryllium Alloys. A non-magnetic alloy , it is thermally solidified by means of spinodal decomposition, a proven heat treatment process. Toughmet 3 CX continuous cast and spinodally hardened condition show tensile up to 120 ksi and hardness up to HRC 34. For a copper alloy comprising of Copper - 15% Nickel - 8% Tin, this alloy sustains a high level of machinability. In spite of the fact that this procedure has been around for nearly as long as precipitation solidifying has been for Copper-Beryllium, current upgrades in spinodal deterioration have given this combination to be matured to a considerably higher quality level—now close to Copper Beryllium, without the beryllium. Malaysia, Africa, Indonesia, Egypt, Algeria, Saudi Arabia, Ethiopa, Kuwait, Iraq, South Africa, Nigeria, Mozambique, Trinidad and Tobago, Canada, Russia, Iran, UAE, Angola, Vietnam, Brazil, Thailand (Bangkok), Mexico, United States, Cameroon, UK, Australia, Azerbaijan, Turkey, Uganda, Venezuela, Israel, Peru, Bahrain, Ghana, Democratic Republic of the Congo, Morocco, Tunisia, Colombia, Houston, Chine, Kazakhstan, Germany, Dubai, Jordan, Argentina, London, Italy, Sri Lanka, New Zealand, Sudan. Riyadh, Conakry, Muscat, Casablanca, Tripoli, Fez, Port Elizabeth, Ouagadougou, Istanbul, Rabat, Kinshasa, Ibadan, Pretoria, Antananarivo, Abu Dhabi, Accra, Tel Aviv, Kampala, Kolwezi, Alexandria, Zaria, Amman, Bulawayo, Dakar, Khartoum, Addis Ababa, Cape Town, New York, Beirut, Johannesburg, Kano, Brazzaville, Lubumbashi, Singapore, Abidjan, Sharm el-Sheikh, Durban, Cairo, Port Harcourt, Luanda, Dubai, Algiers, Doha, Bethlehem, Douala, Dammam, Byblos, Cairo, Jerusalem, Aqaba, Harare, Omdurman, Jeddah, Kaduna, Dar es Salaam, Lusaka, Manama, Benin, Hong Kong, Mecca, Colombo, Maiduguri, Data from the UN, Bamako, Giza, Mogadishu, Freetown, Lagos, Soweto, Maputo, Nairobi, Mbuji-Mayi, Tehran, Subra al-Haymah, Yaoundé.